Xu Wenjing was born in 1894 in Linhai, Zhejiang, courtesy name Jingzhai, the third of six siblings. He was talented and mastered every art he studied, including seal-making, ancient etymology, qin playing and qin making, calligraphy, painting, literature and poetry, and the making of seal clay (the red cinnabar paste used as ink on Chinese seals). His own brand labeled “Zhini Shanguan Seal clay” is widely acclaimed among painters and calligraphers. His older brother Yuanbai (1893-1957) was a guqin master of the Zhejiang school, and a master of Chinese music theory in addition to qin performance and qin making. Master Wenjing’s qin skills were also acquired from his older brother, and later from his brother’s Buddhist master Daxiu Shangren. The Xu brothers, with their shared passion, once lived by the shores of the West Lake in Hangzhou, writing poems, creating paintings, playing chess, and even playing and making qins together. The two also attended the events of the Jinyu Qin Society in Shanghai in 1933 to 1934. In 1935, the two siblings moved to Nanjing along with their work, and established the Qingxi Qin Society promoting the instrument through regular gatherings, teaching, and local radio broadcasts. Unfortunately, with the declaration of the Sino-Japanese War in 1937, the society was disbanded under the fire and smoke of conflict. Xu Wenjing and his family fled south to the British colony of Hong Kong to take refuge from the turmoil in the 40’s. From this historical turning-point, it can be said, that the art of qin-making was transmitted south. At the age of 45, Master Wenjing continued displaying his talents in the qin, poetry, calligraphy, painting, seal carving and paste-making, including establishing his Zhini Shanguan to continue his plans to further refine his quality seal clay paste. Southbound literati grew rapidly in number in the 1950’s, adding a strong cultural atmosphere to a rapidly industrializing Hong Kong, of which Master Wenjing has definitely left his mark. Perhaps due to nostalgia for the elegant gatherings of the scholarly arts in the mainland, he gathered qin collectors, calligraphers, painters, writers, thespians, musicians, vocalists, cultural and education experts under one roof, all taking turns to express their talents with various instruments, voices, and brushes. Talent shone through every seam and music circled the pillars for a period of time. However, amidst the prosperity, Master Wenjing could not help but feel growing anxiety, as his eye ailments worsened and his wife returned to the mainland having not grown accustomed to Hong Kong life. It was during this increasingly difficult and dark period of his life, that he handed one of the qins awaiting repairs under his care to the “Hong Kong Choi Fook Kee Instrument Makers” nearby, and hence began his ties to Choi Cheung-Sau and many subsequent qin players. Master Xu’s eyes failed to respond to medical treatment and he became completely blind by 1957. When he passed away at the age of 81 years old in 1975, he left behind a significant collection of works, including an anthology Xihu Baiyi (“Hundred memories of West Lake”, scribed by Mme. Tsar Teh-Yun), a seal-script magnum opus Guzhou Huibian (“Anthology of Ancient Seal-script Vocabulary”), seven self-crafted handmade qins, his tradition and artisanship of qin-making, and a collection of couplets collected in the Jingzhai Shi’er Qinming (“ Twelve qin inscriptions by Jingzhai”), displaying his dedication and insistence on the scholarly arts with a calm touch in the face of his own deprivation. Master Xu originally planned to make a dozen qins to match his planned twelve inscriptions in his Shi’er Qinming, but his plan never actualized past seven qins before he was incapacitated. “Those who have come, hath gone with the yellow crane,” the author would like to take this chance to record a small vignette among qin fellows: a nameless qin (in the author’s own collection) collaboratively made by Master Xu Wenjing and his disciple Choi Cheung-Sau, as well as the qin Minghe (“Sounding Crane”) handcrafted by Master Xu Yuanbai and later passed down to Yao Bingyan and Yao Gongbai, once met in the study Jingrong Shuwu, a Qing dynasty building in Sha Tau Kok, on May 29, 2011. With time’s passing, the Xu brothers could meet again in spirit since their separation in 1940, seventy-one years ago! Located in room 06 on the fifth floor of the Jockey Club Creative Arts Centre is “Choi Fook Kee Chinese and Western Musical Instrument Makers Company, the only instrument maker in Hong Kong producing guqins. The owner, Mr. CHOI Cheung-Sau, courtesy name Yiwen, is the sole transmitter of Xu Wenjing’s qin-carving artisanship. Choi Fook Kee Makers now focus on the carving of qins, although before the 1970’s the shop focused on all kinds of Chinese and Western instruments. Therefore, most Chinese musicians in Hong Kong recognize this time-honoured brand, and even call the present owner “Choi Fook Kee,” as if the shop and the owner are one and the same entity. We disciples all call him “Choi Sifu,” and the walls of his workshop are filled with recognition plaques from all over Hong Kong, including one from the calligraphy master Zhong Tong that reads “A lineage of fine instrument makers,” a modest description of this workshop owner’s unique history that covers over three generations. Choi Wai-King had great plans. Just as his son Choi Cheung-Sau was born in 1934, he and his wife along with other children and several assistants moved to Hong Kong, where they set up in Central, the “Hong Kong Choi Fook Kee Instrument Makers, Company” (or “Hong Kong Choi Fook Kee” for short.) The original Choi Fook Kee in Shantou was still operated by Choi Chun-Fook and his other sons, until it was merged into the public-private Shantou Instrument Makers after 1949. “Hong Kong Choi Fook Kee” struggled to survive those tumultuous years. The shop was closed during the Japanese occupation as Choi Wai-King and all of his staff farmed the mainland countryside. The factory restarted from scratch in 1945, and moved numerous times in the coming two decades. It is during this era that Xu Wenjing met Sifu Choi. In the early 1950’s, Hong Kong Choi Fook Kee moved to Junction Road in Kowloon City – which wasclose to Mr Xu’s residence. Xu, then suffering from fading vision, handed Hong Kong Choi Fook Kee a qin for repairs. Choi Cheung-Sau, who was then aged 18 or so, was sent to meet Master Xu to learn more about the instrument as the workshop had no experience of qin construction. Sifu Choi then frequented Mr. Xu’s house, and was illuminated by Xu’s collection of qins and calligraphic works, and by his intellect. He was fascinated by the anecdotes of qin lore as well as the music itself. He spent many of his after-school hours and even skipped school to spend time with Xu, and even pleaded with Mr Xu to take him as a disciple in qin-carving. Although Sifu Choi was supposed to be next in line for the workshop and was talented in the trade, Xu was hesitant. Nonetheless, Sifu Choi continued to take care of Mr. Xu and was finally granted his wish. From then onwards, Sifu Choi would passionately bring his tools with him to learn the art of qin-carving in Master Wenjing’s home. Although Xu’s vision/eyesight by then was blurry at best, his hands were adept, and he clearly instructed Choi on the dimensions and shapes of qins, as well as various technical tips and tricks. Xu would then check Choi’s work by carefully feeling over every inch, checking the curvature, thickness, nayin sound poles and strips, and the downward dip by the bridge. He would knock the boards of the instrument with his knuckles to test its resonance, and measure its size with his fingers with due precision, which would impress any carpenter. Carpentry procedures such as sawing, drilling, shaving, and polishing were handled by the young Sifu Choi, while mortar and lacquer work was something Master Xu happily obliged. It was a pleasure just to hear Sifu Choi recount those days when their spirits connected and the arts were transmitted down to the next generation! Master Xu only took two disciples in his lifetime, Choi Cheung-Sau for qin-carving and Teng Siu-Wah for qin playing. In the development of Hong Kong’s guqin tradition, his decision particularly with the former was influential in that Choi would become the master of qin-carving in Hong Kong, servicing qin players in Hong Kong and beyond. Particularly precious is his impartial, honest transmission of the arts, in establishing a qin-making research class, and then creating a batch of qin players who can also make and repair the instrument. Sifu Choi’s success in acquiring qin-carving techniques meant that “Hong Kong Choi Fook Kee” added qins into the service repertoire of their workshop. In the early 1960’s, the qin was still a low-production item, while the workshop toiled away in the manufacturing of other instruments, particularly guitars. The workshop’s name was renamed “Choi Fook Kee Chinese and Western Instrument Makers” (“Choi Fook Kee Instruments” for short), and employed some staff. In 1969, the workshop moved to the Kwun Tong Industrial Complex, Ngau Tau Kok district, where Sifu Choi, then aged 35, oversaw production, a milestone marking the third generation of Choi Fook Kee. They finally settled into this location, and Sifu Choi saw this as his place of business for the next 39 years. According to Sifu Choi, he made over 200 qins himself, averaging 7 to 10 qins per year. What made Sifu Choi decide to pass on the art of qin-carving? In 1992, just as things were smoothly progressing in business and family life, Sifu Choi, then aged 58, suffered an acute health problem, which required immediatesurgery. Facing this daunting turn in life and uncertain whether he could recover, Sifu Choi disbanded his workshop staff and focused on his health in a full-pitch struggle against his disease. Luckily, due to early diagnosis and treatment, he recovered. Looking at his road in life, Sifu Choi pondered seriously the question of retirement, but felt he couldn’t abandon the workshop, which meant decades of his blood and sweat. As he faced this difficulty, several qin players and close associates decided to ask him again to teach them the art of qin-carving in order to transmit the craft to the next generation. Sifu Choi was so humble and did not immediately accept, but after repeated requests and encouragement from Mrs. Choi, “Choi Fook Kee Instruments” started its first qin-carving study group in July 1993. The author was one of those fortunate enough to be among the first participants. We gathered every Saturday, studying how to make qins in 3-hour long sessions either in the morning or afternoon. Although a “class” in name, due to the varying rate of progress among the disciples, it was ultimately still a one-on-one tutelage from Sifu Choi himself. We each had our own workbench, and Sifu Choi would only accept qin players as students – his sincere wishes being to preserve the art. He wanted his disciples to see qin-carving as an artistic and personal pursuit for refinement rather than as a means to attaining material profit. He demands the same of both his male and female students, in his meticulous demands for every carpentry process involved: Sifu Choi would demonstrate in person, and we’d all reference from each other. Within the walls of the workshop, the relationship between peers and between master and student was amiable and full of laughter. The class since its inception in July 1993 has been ongoing for 18 years and is still in process. During this time, the Kwun Tong Industrial Complex was reclaimed by the government, and Choi Fook Kee Instruments moved to its present location in 2008. For these 18 years, Choi Cheung-Sau has successfully taught the art to players such as YUNG Hak-Chi, TSE Chun-yan (Victor), Cheung Shun-yi, Lau Chor-wah, Sou Sitai, Wong Shu-chee, Ng Ying-Wai, Siu Yat-tong, Yu Kin-tim, Lee Chun-yuen, Au Siu-kam, Kwan Ga-hui, Ding Hong (of Macao), Lam Siu-ling, Ho Chun-wah, Tse Wai-keung, Kwok Gang-ming, Lau Ho-ying, Pun Tak-wing, Lam Tze-chiu, Tong Wan-hoi (of Macao), Fung Chi-hung, Yuen Chi-tai. Later students who are still able to produce their first qins include: Huang Bat-mui, Ho Wing-tze, Law Siu-lung, Zhong Siu-sang, Hung Kam-tung, Lie Leung-hing, Lee fei, Chan Kui-pang. Also, Lo Siu-wah is studying both qin and zheng construction at the same time from Sifu Choi, which totals 33 disciples to date. Together, they founded the “Choi Cheung-sau Qin-carving Association” in 2011. – His generous act of opening a class to pass on the flame of his expertise was indeed an act rarely seen in China or even the whole world at the time or even today. His continued dedication even after these 18 years is a role model to us all. – Since the 1960’s, despite an increasingly Westernized society in Hong Kong, as well as the health crisis and the prospect of facing a workshop alone, Sifu Choi was still dedicated to the making of quality qins – this can be said to be a legend for the history of Hong Kong in the past half-century. – Sifu Choi was determined to study under Xu Wenjing, and persisted until he got through despite repeated refusals. His dedication and sincerity has in turn been reciprocated with a turn in his life that brought him to greatness. This spirit is a role model to the younger generation. – His care for fellow qin players and attitude toward qin-making as an art rather than a commercial pursuit is a respectable virtue scholar-literati. His selection of only qin players as students and equal treatment of the sexes reveal his pure spirit. – Against worldly common-sense, Sifu Choi openly divulged the secrets of his trade and abandoned the deviant practice of leaving trade secrets within the family. His unselfish act and broad spirit gains the respect and admiration of us all. – Sifu Choi, with his roots deeply settled in Hong Kong, faithfully completed his mission as a qin-carving master connecting the past and future. Yet, he is humble about his identity as a “qin maker”, and does not gloat in the name or prestige of a master. Sifu Choi would always recount how many of us were his faithful customers who then became friends, and then his students. The bonds of master and disciple – of both tutelage and friendship, are best represented in the bonds of Choi Fook Kee! 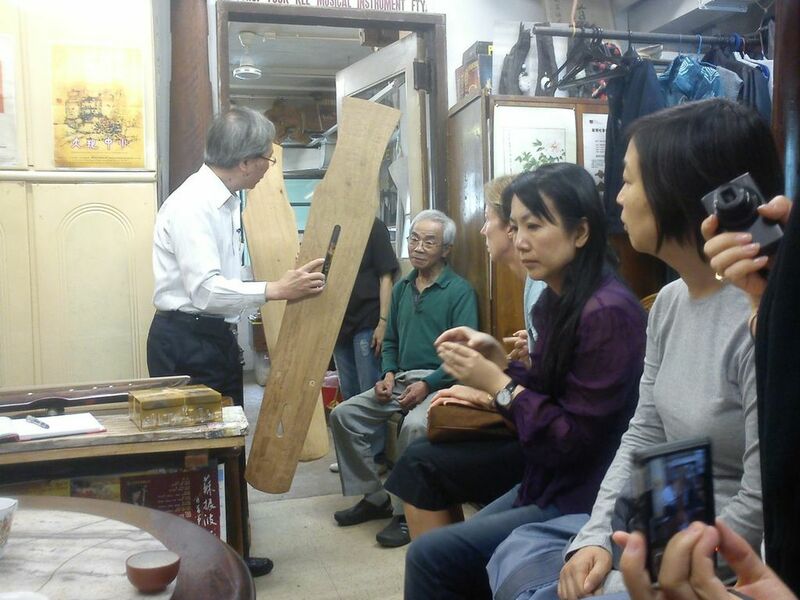 Thanks to Master Xu Wenjing and Sifu Choi Cheung-sau, a large group of Hong Kong and Macanese qin players were able to experience the satisfaction of qin-making, as well as the pleasure of playing an instrument crafted by their own hands. In the strokes of splitting, drilling, carving, and polishing, Sifu Choi has imparted to our generation a new understanding of our instruments, and made a small stride on the long road of tradition. Thus I wrote this essay to record the grace of Great Master Xu Wenjing and Master Choi Cheung-Sau, as well as the endeavouring spirit of my fellow peers. http://wp.me/piVJs-q4 This describes some places where you can buy strings. I am going to be back mid-June, but I can’t help you in person until then. At the meantime, if you don’t know how to do this yourself, please contact me.